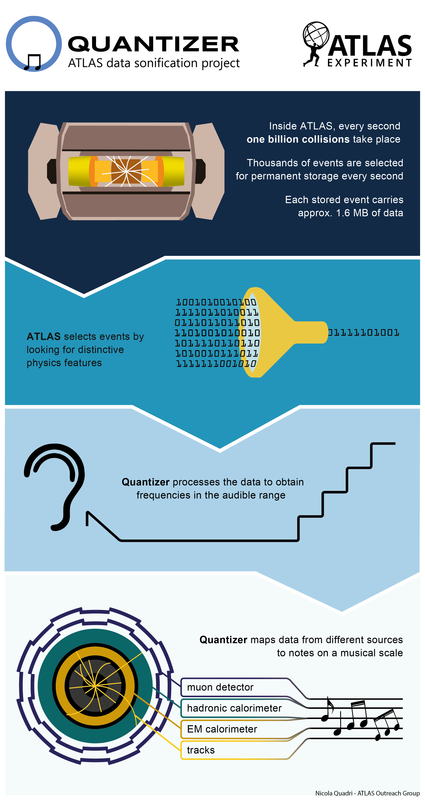 Quantizer Infographic by Nicola Quadri/ATLAS Outreach Group. From techno beats to classical melodies, from jazz swinging to pop and rock riffs – the ATLAS experiment can play them all. Thanks to Quantizer, a platform that translates ATLAS events into notes and rhythms, one of the most complex scientific instruments in the world will not only search for new physics, but also generate music. Quantizer was conceived by Juliana Cherston, a Master’s student in the Responsive Environments Group at the MIT Media Lab, and designed in partnership with ATLAS Doctoral student Ewan Hill from the University of Victoria. They have just released Quantizer on the web, providing real-time audio samples produced with the latest data. Less than a year later, her project became a reality. Quantizer challenges artists and composers to explore the thin border between science and art. At the same time, it is a powerful tool for outreach and education, since its music embodies fundamental physics research in a more intuitive and appealing way. But how does it work? First, Quantizer takes the data released through the ATLAS Live website and applies a noise filter. It then clusters the data geometrically, scales it and shifts it – to ensure that the output is in the audible frequency range – and then maps the data as notes. Most recently, the project was presented at the CHI 2016 conference (paper available here). Different elements of the project will be presented at the New Interfaces in Musical Expression conference in July 2016 and at ICHEP in August 2016. Discover Quantizer for yourself and listen to the wonderful sound of physics!